We are committed to ongoing product development and expansion, our aim is to provide simple solutions to complex insurances. 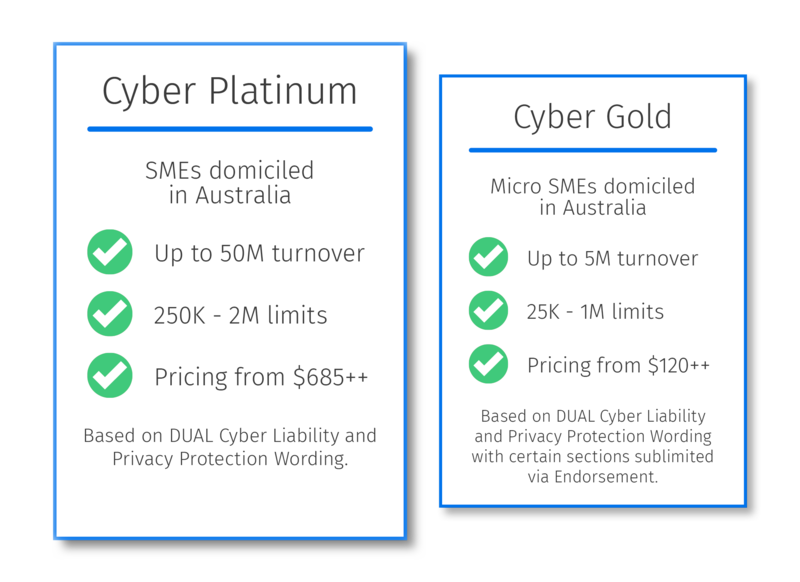 Cyber Platinum is DUAL's original Cyber offering and is designed for SME clients with up to $50,000,000 turnover. 1 in 4 Australian SMEs have fallen victim to cyber-crime, however only 14% of SMEs currently purchase this critical cover. When small businesses experience a significant cyber breach, 1 in 3 won't survive more than a week without their critical information, and 60% go out of business within six months. Since launching on the WebRater in 2015, brokers have generated almost 60,000 New Business Cyber indications and bound 5,000 policies, highlighting the benefits of DUAL's market leading Cyber coverage. Cyber Platinum provides limit options between $250,000 and $2,000,000 with pricing starting from $685 plus charges. For a detailed overview of the Cyber Platinum Product, click here for a copy of our Open Market Cyber Platinum profile. If you need further information on this offering, please contact your local DUAL Underwriter. Norton SMB Cyber Security Survey 2017. Cyber threats and solutions for small and midsize businesses, Vistage 2017.